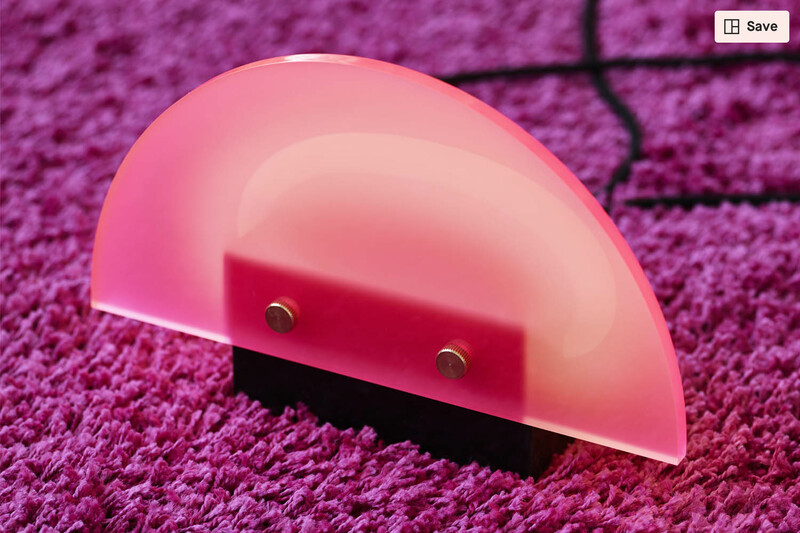 A brightly coloured acrylic shade softens the neon glow of an LED tube that arches over its marble base in the new Vice table lamp from Danish accessories brand Lucie Kaas. The base acts like a vice clamp fixed with two prominent screws. It clamps around the curved LED tube that loops over the top, glowing through the semicircular acrylic shade while mimicking its shape. The shade comes in the brand’s flamingo pink, Miami green and misty purple, colours that are rich enough to diffuse the light without concealing the shape of the tube. Designed by the brand’s founder and creative director Esben Gravlev Rasmussen, the lamp’s shape and colours nod to the bold geometric designs of the twentieth century Art Deco and Pop-Art movements. Esben also wanted to capture the eclectic and varied use of material seen in the 1980s Italian Memphis movement. Lucie Kaas was originally established to relaunch accessories from the Scandinavian design archives and Vice is the brand’s first venture into lighting.